Print these cards out on cardstock (laminate for heavy use). Provide mini erasers or some other small manipulative for students to use. Young learners will place a numbered group of items on its corresponding card. As children pick up and place each item, encourage them to say its number name (one, two, etc.). Print these cards out on cardstock (laminate for heavy use). Students will count each set of teeth and clip its corresponding number with a clothespin. To make this activity extra fun, decorate the clothes pins with glitter and foam star stickers, so that children will have their own sparkly tooth fairy wands! Print these cards out on cardstock (laminate for heavy use). Provide a small manipulative for children to use as bingo markers. Five in a row (horizontally, vertically, diagonally) equals BINGO! While playing, be sure to facilitate discussion about each healthy food shown. Healthy Teeth – Graphing – Instruct children to count one group of items at a time and to color the corresponding boxes. Students can then count the colored squares again, and write the numbers. Discuss which items there are more of and which there are less of. Happy Tooth, Sad Tooth – Classification – Prompt young learners to study the pictures and determine which foods make for a happy tooth and which make for a sad tooth. Children can then cut, sort, and glue the items on their appropriate spaces. How to Brush Your Teeth – Sequencing – Children will cut out the pictures and work to put them order. Once the pictures are properly sequenced, they may be glued and colored. Depending on the child’s ability, only three cards may be used. Writing Prompt – “I brush my teeth because…” – Children will dictate their responses to teachers and draw a picture. Older children may copy their responses onto their papers, while some may even be able to write some of their own words. Healthy Food – Patterning – Have children cut and glue to complete the patterns. Discuss the patterns, and encourage young learners to describe and identify them. Fill Your Plates – Number Quantity – Children will cut out the pictures, count each set, and glue to match the numbers. Yummy Foods – Beginning Sounds – Students will color the picture of the matching sound. 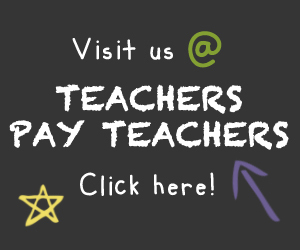 Writing Prompt – “I eat healthy food because…” – Children will dictate their responses to teachers and draw a picture. Older children may copy their responses onto their papers, while some may even be able to write some of their own words. Get this Happy, Healthy Me! 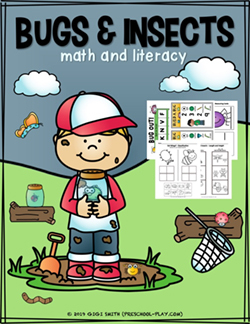 Math and Literacy pack. Every year I like to take my class out for a nature walk to observe the signs of fall. On these walks, we often come across a busy squirrel or two. 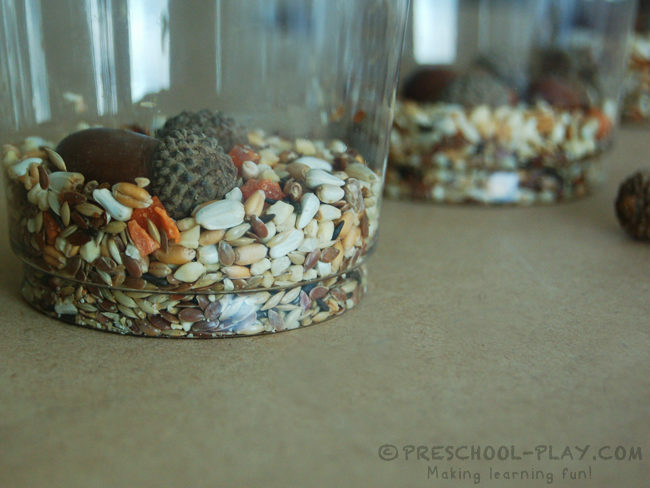 This provides the perfect teaching opportunity about why squirrels gather and store nuts and seeds for the approaching winter. 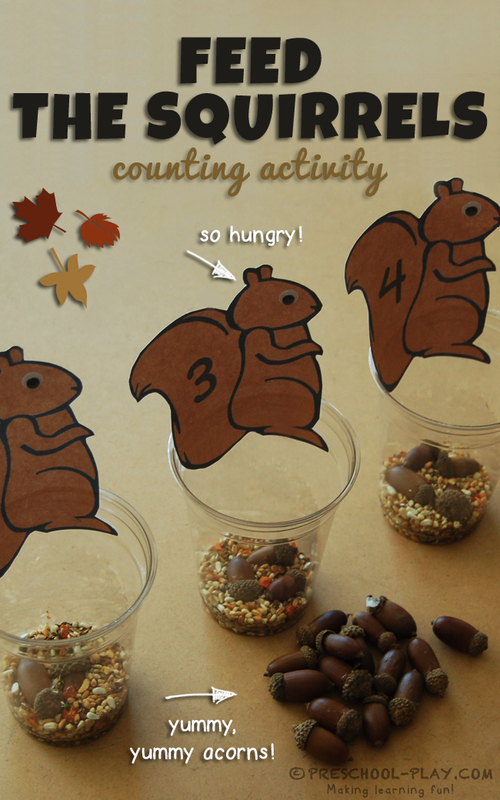 To extend this lesson I developed this entertaining counting game which teaches number sense. Line the squirrels up in a row, and provide the children with a pile of acorns. Then instruct them to place the correct number of acorns (the amount that corresponds to the number on the squirrel’s tail) in the cup. As children pick up and place each acorn, have them state the correct number. In doing so, they will strengthen their one-to one-correspondence skills. When all the acorns have been correctly placed, ask the students if they would like to count all the squirrels. This will increase their ability to count to 10 in an accurate sequence. This game also helps to strengthen fine motor skills. As an added challenge, tweezers and tongs can be used to pick up the acorns. I have found this activity to be very popular with the majority of my class. I hope that you find that your students enjoy it as well. 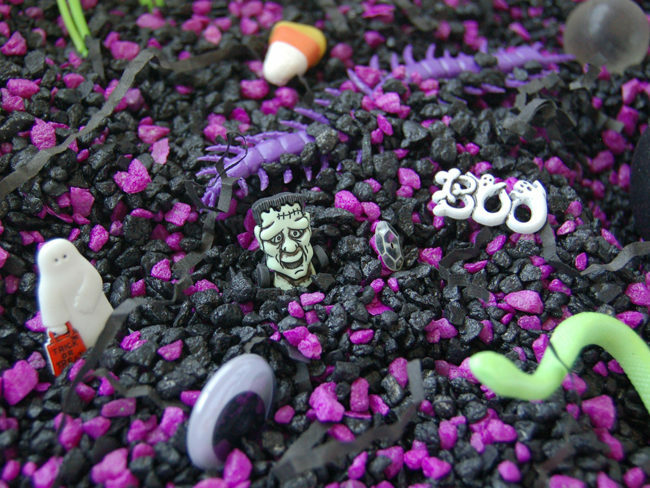 This Halloween sensory bin is made of just a little bit of spooky and a whole lot of fun! Children learn best by using their senses. Tubs filled with a variety of substances and materials enable young ones to use those senses to explore things that capture their attention. As they manipulate the objects, they are seeing, touching, smelling, and hearing. This allows them to collect information and make discoveries, which leads to the practice of many learning concepts. Young learners build language, social emotional, and problem solving skills as they work alongside their peers to delve into the bin’s contents. They increase their math skills by counting, sorting, and classifying different elements. Quantity comparisons are also made as they decipher who has more “spiders” or “rocks” in their “cauldrons”. Additionally, scooping, pouring, and picking up different items helps to strengthen fine motor skills and eye-hand coordination. 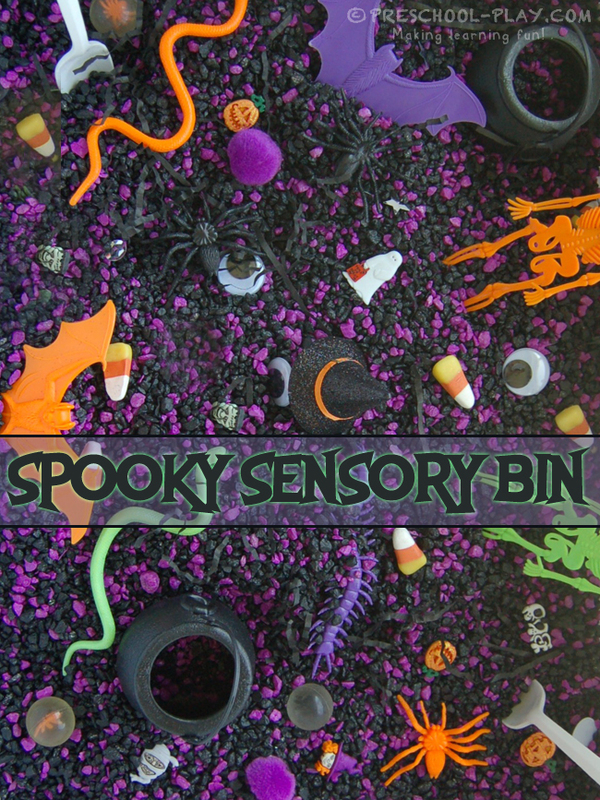 Without a doubt, sensory bins are one of the best hands-on learning tools. So hurry and gather up a container and some spooky goodies!